So, here’s a friendly reminder that you can do wonders with leftover chicken (or turkey for that matter). 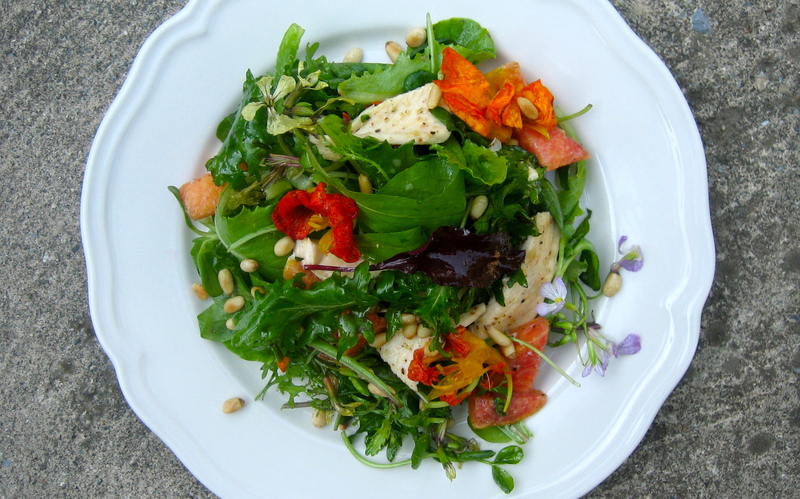 For this particular salad, I tossed thinly sliced chicken breast with a tumble of gorgeous fresh greens and flowers from the farmer’s market, along with juicy nectarines. I topped it off with toasted pine nuts, and an easy vinaigrette, and dug into a bright, healthy, refreshing lunch. I’ll provide the quantities I used below, but think of this more as a reminder really, of how perfect the salad-as-meal is, especially in summer. There are so many delicious directions you can take here, from substituting the nectarines with cubed pineapple, pitted cherries, or quartered figs, to swapping the pine nuts for whichever nuts you have on hand. Armed with greens, chicken, a fruit, and something for crunch, a delicious, healthy meal is only a few minutes away. Juicy nectarines provide a refreshing contrast to thinly sliced chicken breast in this light and summery salad, topped with aromatic pine nuts. 1. In a pan over medium-low heat, toast the pine nuts for a few minutes, until lightly golden and aromatic, shaking the pan often, and keeping an eye on it. 2. Place the dressing ingredients into a jar and shake vigorously until emulsified. 3. Place the chicken in your salad bowl, and toss with one tablespoon of the dressing. Add the greens and nectarines, and add another tablespoon of the dressing, tossing gently. Taste, and add more dressing if desired. Top with toasted pine nuts. 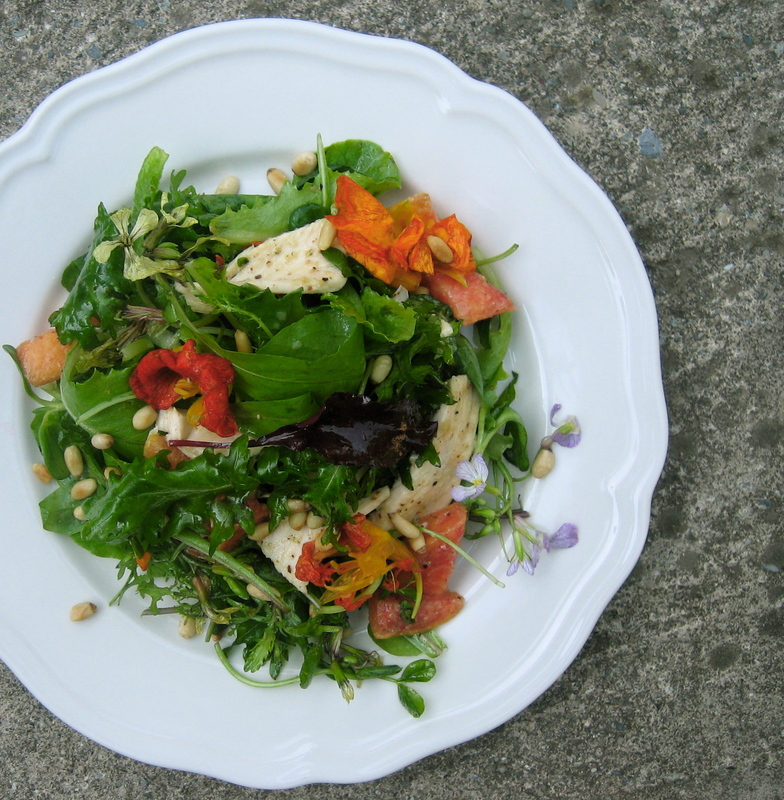 This salad looks so refreshing, and your photo is beautiful, the little flowers are great!